If you've caught a bad cold or the flu and you follow the gluten-free diet, you need gluten-free cough, cold, and flu medications. Fortunately, you have a wide variety of options available in pharmacies and big box stores throughout the United States. Even if your preferred brand of medication isn't considered gluten-free, you should be able to find a substitute with the same ingredients. If you look at your symptoms (possibly including pain, fever, nasal congestion, and/or cough), and then look at the ingredients in the products listed, you should be able to identify a gluten-free medication to treat your specific symptoms. Below you'll find a list of name-brand cold, flu, and cough over-the-counter medications and what their manufacturers say about their gluten-free status. In cases where the name-brand products are not considered gluten-free, you'll also find potential store-brand gluten-free substitutes for those products. No gluten ingredients. Advil Cold & Sinus (non-drowsy) contains the active ingredients ibuprofen 200mg and pseudoephedrine HCI 30 mg. According to Pfizer Consumer Healthcare: "Gluten is not added to any Advil® product during the manufacturing process. However, we cannot guarantee that minute amounts of gluten or gluten derivatives are not contained in raw materials obtained from various suppliers for our manufacturing process since the end product is not tested for gluten." Gluten-free. Afrin makes nasal sprays and mists designed to help you clear nasal congestion. Anything you spray into your nose can wind up in your throat, and subsequently in your digestive tract, so any nasal spray you use must be gluten-free. Afrin has numerous nasal spray products, including a "No Drip" line that will not drip down your throat. You can choose from Original, Allergy Sinus, Severe Congestion, and Extra Moisturizing in pump mist and nasal sprays. All contain the active ingredient oxymetazoline hydrochloride 0.05 percent, which is a nasal decongestant. All are safe for those who follow the gluten-free diet, according to manufacturer Bayer, which states that "None of the Afrin formulas contain gluten." Dye-free Multi-Symptom liquid gels for day and night (contain the same ingredients as the Maximum Strength Cold & Flu Day and Night liquigels). According to manufacturer Bayer: "We don't add gluten to our products. However, we can't guarantee they are 100 percent gluten-free since our products are produced in a facility that manufactures and packages items that may contain gluten." Nighttime Cough + Cold in mixed berry flavor (contains pain reliever/fever reducer acetaminophen 650 mg, antihistamine diphenhydramine HCl 25 mg, and nasal decongestant phenylephrine HCl 10 mg). According to manufacturer Reckitt Benckiser Group plc: "While these products are not formulated with any ingredients that contain gluten, we have not certified that these products are gluten-free." Maximum strength Mucinex DM extended-release caplets (contains guaifenesin 1200 mg and dextromethorphan HBr 60 mg). Like Delsym, Musinex is manufactured by Reckitt Benckiser Group plc, which states it does not use gluten-containing ingredients has not certified that the products are gluten-free. Peak Cold Multi-Symptom Cold (dextromethorphan HBr 20 mg, guaifenesin 400 mg, and phenylephrine HCl 10 mg). Drug manufacturer Pfizer Inc., which makes Robitussin products, does not provide a list of gluten-free products and does make some gluten-containing medications. Sudafed PE Pressure + Pain + Mucus (acetaminophen 325 mg, guaifenesin 100 mg, and phenylephrine HCl 5 mg). According to a customer service representative: "No gluten ingredients are added to Sudafed or Sudafed PE products. However, we cannot guarantee the product is gluten-free since we have not tested for its absence." According to the manufacturer: "Following a review of the product formulations and detailed supplier documentation, we can confirm that Theraflu products* do not contain gluten as a directly added ingredient. However, GSKCH does not test the final products for the presence of gluten, and therefore cannot rule out the presence of trace amounts as a result of third-party manufacturing processes." According to a customer service representative, Tylenol cannot guarantee the products are gluten-free because it does not test them for gluten. Several different manufacturers sell natural remedies such as vitamin C, zinc, echinacea, and elderberry that are intended to prevent or shorten colds. Note that there's little or no medical evidence showing that these products are effective in preventing or shortening colds or the flu. However, if you're interested in trying them, many are gluten-free. Some gluten-free products. Airborne, a popular remedy that's designed to help your immune system ward off colds and flu, isn't a drug. Instead, it's a series of supplement-based products designed to help your immune system fight whatever cold or flu bug you've contracted. Airborne first was developed by a teacher who wanted a natural way to fight the colds and flu that inevitably make their way around schools. Out of the various Airborne products, the orange chewable tablets are considered to be gluten-free. Target's Up & Up brand offers gluten-free chewable immune support tablets in two flavors: berry and citrus. Note that the Up & Up effervescent immune support tablets are not gluten-free. Gluten-free. The Emergen-C products sold in the cold and flu section of the pharmacy are billed as "enhanced immune support formulas," and they contain a combination of vitamin C, vitamin D, vitamins B6 and B12, biotin, zinc, and manganese. They're available in various flavors, including Super Orange, Cherry, Blueberry-Acai, Raspberry, and Citrus. You can purchase formulas that dissolve in water, gummies, and chewables. All Emergen-C products are gluten-free, according to manufacturer Alacer Corp.: "All EMC products are gluten-free. We adhere to the FDA’s regulation for a gluten-free claim. Our products have been tested by an independent third party laboratory that has verified our products to be under 20 parts per millions of gluten and therefore meeting the definition of gluten-free." No gluten ingredients. Zicam products are homeopathic remedies. They're available in "cold-shortening," nasal congestion/sinus relief, allergy relief, and kids' cold relief formulas, and come in chewies, drops, crystals, quick-dissolve tablets, and nasal sprays in many different flavors. According to manufacturer Matrixx Initiatives, Inc.: "None of the ingredients or manufacturing processes contain glutens derived from wheat, rye or barley. However, some Zicam manufacturing facilities use equipment that may have come in contact with gluten agents." Although there are numerous gluten-free cold and flu products available, you'll notice that most of those on the market are medications that combine several ingredients (usually a pain reliever, a decongestant, and a cough suppressant). It can be tricky to find gluten-free products that feature only one active ingredient aimed at one cold and flu symptom (for example, a cough suppressant). Target Up & Up Sinus PE tablets (30 mg pseudoephedrine HCI) is one such product, and Target Up & Up Maximum Strength Mucus Relief (guaifenesin 600 mg) is another. It's easier to find single-active-ingredient gluten-free pain relievers, since multiple store brands are considered gluten-free. In addition, note that although there are several over-the-counter pain relievers on the market, most cold and flu products designed to offer pain relief and fever reduction include the active ingredient acetaminophen. In fact, the U.S. Food and Drug Administration says that more than 600 over-the-counter medications include acetaminophen... and that means you could be taking more of it than is safe. Acetaminophen can cause severe liver damage in doses above the FDA's adult maximum daily dosage of 4,000 mg per day. To avoid exceeding that dose, don't take more than one product (prescription and/or over-the-counter) that includes acetaminophen, and never exceed the recommended dose of any product that includes acetaminophen. A few products (mainly Advil Cold & Sinus) use the pain reliever/fever reducer ibuprofen instead of acetaminophen, one Alka-Seltzer product uses the pain reliever/fever reducer aspirin, and one Sudafed product uses the pain reliever/fever reducer naproxen sodium. However, none of these products are considered gluten-free (see the Advil section for substitutes containing ibuprofen). Regardless of which cold and flu product you take (and whether or not it includes acetaminophen as an active ingredient), never take more than the recommended daily dose, and don't take more than one multi-symptom product at the same time. 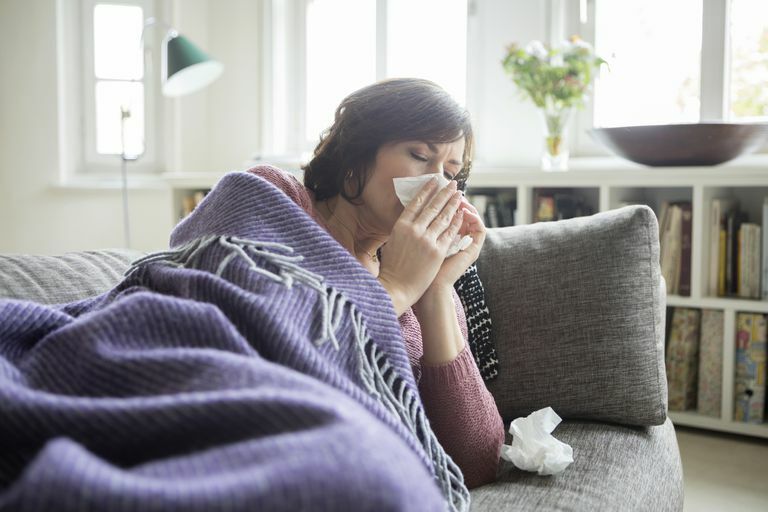 There are ways to feel better from the cold and flu without medication, including rinsing your sinuses, using a nasal saline spray, running a humidifier, or combining steam with eucalyptus oil. Consider trying these to improve your symptoms. Finally, most colds and flu resolve themselves within about a week without intervention from your healthcare provider. However, you should know when your symptoms warrant medical attention. If you find you have difficulty breathing or shortness of breath, confusion, sudden dizziness, or chest pain, you should seek help right away. U.S. Centers for Disease Control and Prevention. The Flu: What To Do If You Get Sick fact sheet. U.S. Food and Drug Administration. Don't Double Up on Acetaminophen fact sheet.